In his latest lesson for us all, John reveals those players capped as a back and a forward, drop goal specialists in the Super 12/14, Lions tour openers and FA Cup Final connections. Versatility is as old as Test rugby. The Clapham Rovers player, Reg Birkett, was a forward for England in the first-ever international match, staged at Raeburn Place in Edinburgh on 27 March 1871. England lost to Scotland, Birkett scoring their only try that day. The early internationals were 20-a-side matches, but by 1877 teams had been reduced to fifteens. Towards the end of his career, when the game featured fewer forwards, Birkett was selected for England as a threequarter. Another forward in that first international was Scotland's captain, the Hon Francis Moncreiff. He led Scotland as a half-back in the return match at Kennington Oval in 1872. Arguably the most versatile of all Test players was the Springbok, Danie Craven, who started international matches as a centre, fly-half, scrum-half and No.8 for South Africa in the thirties. 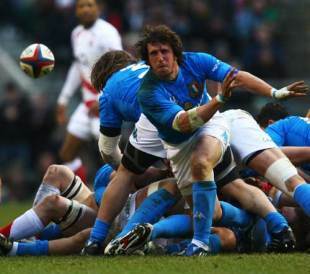 Mauro Bergamasco, the current Italian flanker, has started in two positions behind the scrum, appearing at Twickenham earlier this year at scrum-half and winning caps as a wing in the 2003 Six Nations. René Lasserre, who played for France before and after the Great War, won his first cap as a fullback and also played as a centre before becoming the outstanding French flanker of the early twenties. *List excludes those New Zealanders (and opponents) who occupied the "rover" position, a hybrid scrum-half/wing-forward who stood adjacent to the scrum before the 2-3-2 scrum formation was outlawed in the 1930s. Steyn has also set a new record for most dropped goals in a Super 12/14 season. He has kicked ten this season, three more than the previous record set by Koen (for the Bulls) in 2003. In the dozen previous tours to South Africa the Lions won nine of their opening matches and lost three. The worst start to a South African tour was in 1903 when Mark Morrison's side lost the first three games, all staged at Newlands in Cape Town. They were the first British/Irish team to lose a Test series, drawing two Tests and losing the third and final one of the series. The Lions of 1955 were the last outfit to lose their opening match, but they did go on to share the Test series 2-2. In the early days of organised sport some clubs played both codes of football. In the early 1870s, for instance, the Clapham Rovers club in London used to play rugby one weekend and soccer the next. The club featured in successive Cup Finals in 1879 and 1880, winning it in the latter year when Reg Birkett (see also the first question) played. He had been capped by England at rugby four times between 1871 and 1877. Before Birkett, Henry Renny-Tailyour played rugby as a forward for Scotland against England in 1872, played soccer for the Scots the following year and was in the Royal Engineers' Xls that contested the 1872, 1874 and 1875 FA Cup Finals, achieving his winners' medal in his last appearance. John Sutcliffe scored a try and kicked a conversion in his only rugby Test for England, against the New Zealand Native team in 1889, before switching codes later the same year. He joined Bolton Wanderes and was their goalkeeper in the 1894 Final, when they lost 4-1 to Notts County. The only other rugby international with FA Cup Final connections was the London Scottish fullback, Pat Harrower, who played for Scotland against Wales at Glasgow in 1885. Twenty years later he refereed the Aston Villa - Newcastle United final at Crystal Palace. The great all-rounder Charles Fry, who played in the 1902 Cup Final for Southampton, narrowly missed out on both a rugby Blue at Oxford and an England rugby cap. He was a Barbarian, however, turning out for the club on the wing in their Christmas holiday fixtures against Bath, Cardiff and Newport in 1894. Rory Underwood set the Twickenham Test record, crossing five times against Fiji in the 1989 autumn international. He also scored a hat-trick at the ground playing against Argentina in 1990. Only Jason Robinson has also scored three or more tries twice in Twickenham Tests.